for “Hold On for Dear Life” during bearish market. Long-term HOLDers, refuse to listen to FUD “Fear, Uncertainty and Doubt” in cryptocurrency market. Since the beginning of the year we experienced a bearish market which caused many people to sell off their Bitcoin as the SEC (Security Exchange Commission) sought ways to regulate the cryptocurrency market. Therefore, in the request to make Bitcoin an ETF (exchange-traded fund) was denied which may adversely affected the market. Why are prices increasing? However, there has been a rally in the market as Bitcoin price has move over the $8000.00 mark. Which tends to have great news behind the movement. In a Forbes article several sources from SEC and Commodity Futures Trading Commission (CFTC) are certain that the bitcoin ETF will get approved. Earlier in the year CBOE introduced Bitcoin in the futures market which means that large asset manager desired to take advantage of the funds being created from the buy and sell signals in the cryptocurrency market. Chief Executive Officer David Solomon from Goldman Sachs is looking to add more Bitcoin and cryptocurrency services to their portfolio as well. In any market it is all about movement some people make money with swing trading “buying low and selling high”. Others make money during a sell off which is betting on how low an asset will dip. For many HODLers of Bitcoin, there is joy in seeing news regarding Bitcoin becoming an ETF again. Which means there is more belief in the asset which cause more movement in the market. 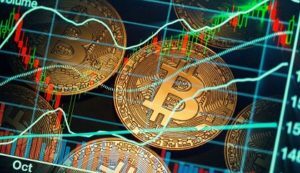 As more U.S. asset managers aim to list cryptocurrency as index fund the more movement the market will see. The cryptocurrency market capitalization is nearing $300 billion which is attracting the large asset management companies as well. For those who choose to get involved in cryptocurrency click here for one the best resources to get started and learn about this movement quickly. In comparison if you are knowledgeable of cryptocurrency and want a walk through training on trading within the cryptocurrency market there is a program for you click here. It is definitive source for Everything Bitcoin and Cryptocurrency!